It seems as if I've quit again, so as a result, I'm starting over again. Back to the basics. Face on the floor. Begging my body for forgiveness. On Thursday, I got an amazing text from my friend Crys. She had reached onederland. I actually shed a tear or two, because I was so happy for her. But at the same time, I was totally disgusted with the fact that I was eating my 10th piece of candy for the day as I was envying my friends progress. It was a slap in the face. Have you ever seen one of those Lifetime movies about someone with multiple personalities? One where the lady (or man) slips from one personality to another, then runs to the mirror only to find that they've committed some horrible act while they were that other person. And then they are just sick because they have to fix whatever problem fast before anyone notices? Or they wonder WHO has already noticed? Yeah... that's how I felt. I looked in the mirror and was horrified at the person who looked back at me. Why have I let myself do this AGAIN? Why do I trick myself into thinking I'm in control, when obviously I'm not. My pants are tight, my leg is swollen, my feet, back and legs hurt all the time. And my indigestion is horrible. But I still eat the candy. And drink the sweet tea. And eat that second helping. Thursday night was rough. Not only did I have to face the facts about spiraling out of control about my diet, I had to re-live and evaluate other personal areas of my life, too. It's not hard to put two and two together... My personal issues are directly related to my weight gain and lack of control. I'm emotional eating like crazy and I know it. So what's the solution? I have to fix me. From the inside out. I have to stop ignoring the obvious. I have to take control of all aspects of my life. And it's going to be hard. So hard that I doubted at first if I am strong enough to do it. Thank GOD for friends who remind me that I'm strong enough to do anything I put my mind to. And I'm worth it. As much as I would like a magic wand to erase the mistakes I've made over the past few months, I know it's going to to be a slow process with lots of hard work. I can deal with that. I'm ready to do something. I can't just eat myself to death because I don't want to face the hard issues in my life. You are enough. Just repeat that over and over until you believe it and in the interim, I'll believe it enough for the both of us! You're strong. You're a fighter and you've got this. In ALL areas. You ARE strong enough, and even if it takes a hundred re-starts IT IS WORTH IT when you get to the end. We both know it. I've messed up and started again many times. I beat myself up and feel quilty. But I keep trying and I always hope that THIS try will be the successful one. I know exactly where you are coming from. We have to set our mind straight and make ourselves number one priority. Good luck to you...I'm rooting for you!! Hello Hollie! I can't tell you how many times I've "been there". I know exactly what you mean in every aspect of this post! I had verticle sleeve gastrectomy back in June of this year, because I had such a hard time keeping in control and this solution was hard to decide on but it was a less invasive option. But I still have a long way to go still, I still find it hard to break habits (they really do die hard) and not eat emotionally, etc. I sometimes wonder if I'm having a harder time than others do. But now I see I'm not alone! I'm glad I found your blog. Very true! 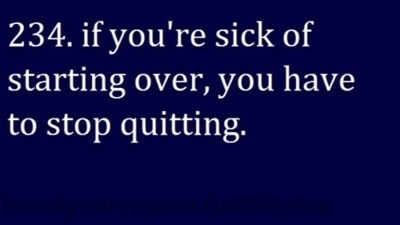 If you keep on quitting, then you end up doing it over and over again. So if you still have not achieve your goal, you should not stop in the middle of your journey or else you will go back to square one. My journey is detailed at: www.slimv.blogspot.com and i'm taking it one step at a time because the point is not to punish myself for all the bad eating habits, but to teach myself to eat healthy anf get back on track. You are on the right path. Its normal t take a break. Thanks for sharing. You are right - you need to start from the inside out, and fix whatever it is in your mind that's stopping you. Deep down, all of you has to really want it. The positive? At least you're starting again. You can see what you need to do and you have a plan. Some people start, quit, and never start again. Congrats on coming back. You're not starting over. It's a long journey, and we all need some breaks. You can do this. I enjoyed reading you blog and all the comments. It does have alot to do with your thought process and your commitment. Have lost alot of weight myself. Took me 8 months with a few relapses. My friend introduced me to some of his success products. He just started a blog a lot of good reading and products to help. http://www.livestronge.blogspot.com/ I can't stress how hard it is but with the right mind set I can not stress how easy it became. Wish you the best of luck on your path to happiness.